Join us and fight the spread of infectious diseases such as influenza, hand, foot and mouth disease, tuberculosis, and pneumococcal disease. We’ve created a song to get you started! Watch on to see how you can do your part. Be it at home, in school or at public areas, do your part by practising good hygiene to keep your loved ones and yourself protected and healthy. F.I.G.H.T. are 5 simple steps you can take to prevent the spread of flu and other infectious diseases. To learn how to F.I.G.H.T., click on the tabs below. Hand washing with soap and water has been proven to prevent many diseases; hence it is important to wash your hands regularly and thoroughly. You can also use an alcohol-based hand sanitizer if there are no hand washing facilities available. Your phone can carry thousands of different types of bacteria – that’s dirtier than a toilet seat! 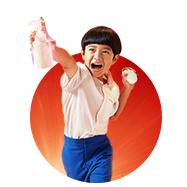 Keep germs at bay by cleaning your phone and washing your hands regularly. After touching shared surfaces like tabletops, doorknobs, handrails, etc. What are the correct steps to wash my hands? Why is it important to wash my hands frequently? One way you can get the flu is when your hands come in contact with a surface/object containing the flu virus and then touching your mouth or nose. Washing your hands frequently not only lowers your risk of falling sick, it helps prevent spreading the flu to others. Why can’t I just wash my hands with water? Washing your hands with water alone is less effective than washing them with soap. That’s because the rubbing and friction from using soap breaks down the grease and dirt that carry most germs, leaving your hands clean and smelling pleasant. Immunisation is when you are made immune or resistant to an infectious disease through a vaccine. This stimulates your body’s immune system to protect you against subsequent infection or disease. Flu viruses are constantly evolving, and your immunity to the viruses may also decline over time. That’s why an annual flu vaccination is recommended to stay protected. Unless contraindicated or advised otherwise, healthcare workers and travellers will also benefit from vaccines. Vaccinations for diseases such as flu and pneumococcal disease can be paid through Medisave for the at-risk populations such as the elderly and persons who have chronic medical conditions. I got a flu shot last year, do I need to get it again this year? Flu viruses are constantly evolving and your immunity may decline over time. Annual vaccination is highly recommended to give you and your loved ones the best protection. Flu vaccines cause antibodies to develop in the body about two weeks after the flu shot. These antibodies provide protection against infection with the virus that are in the vaccine. Hence, it is advisable that you get your flu shots early. Are there any side effects from getting a flu shot? The majority of side effects are mild. The most common complaints are soreness, redness, tenderness or swelling at the injection site. 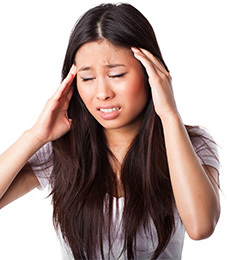 Low-grade fever, headache and muscle aches may also occur in some individuals. As they say, prevention is always better than cure. If you feel under the weather, see a doctor immediately. Knowing the symptoms of highly contagious diseases like the flu can be helpful. Some of the common flu symptoms include fever, cough, sore throat, runny or stuffy nose, body aches, headache, chills and fatigue. 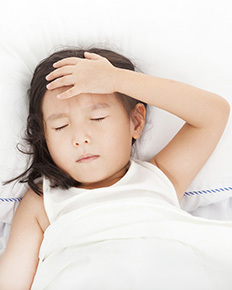 Persistent high fever and extreme exhaustion are common symptoms of the flu. If you experience any of these symptoms, go to the doctor and seek treatment early. Although both conditions have similar symptoms, persistent high fever between 38°C to 41°C, severe headaches and extreme exhaustion are commonly associated with the flu. Why should I see the doctor instead of performing self-medication? The flu is more severe than the cold. And without the right treatment, it may cause complications such as pneumonia and bacterial infections. To avoid a misdiagnosis, go to the doctor when unwell. If you are feeling sick or unwell, stay at home to rest. Avoid school, work, hospital visits and crowded places including shopping malls, because being in close proximity with others may increase the spread of diseases. More importantly, during this time of rest, you should not engage in any strenuous physical activities like running and jogging, as they may worsen your condition. Remember, rest is best. 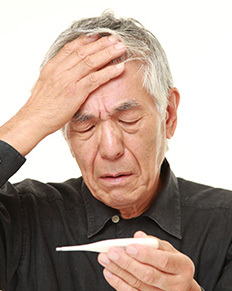 Adults can potentially spread the flu to others even up to seven days after getting sick. Spare a thought for others, stay at home to rest when you are unwell. If I have the flu, when can I return to work/school? 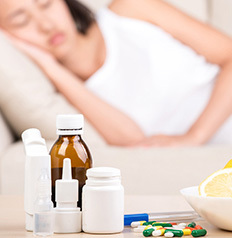 If you have contracted the flu, stay home to rest and recover. Return to work/school when you have had normal body temperature (without taking fever-lowering medication) for at least 24 hours. Whenever you feel the urge to cough or sneeze, quickly use a tissue to cover your mouth and nose. This prevents the release of infectious respiratory droplets into the air. 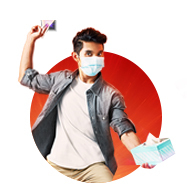 Remember to properly dispose of used tissues and masks in rubbish bins,​ and wash your hands after doing so. By practising these steps, you can help to prevent the spread of diseases. Every time you sneeze or cough, you are releasing thousands of infectious droplets into the air. Don’t contribute to the spread of infectious diseases to others; cover up with tissues or masks. Hold the mask via the ear loops, and ensure that it covers your mouth and nose. Then place the loops over your ears. Pinch the metal strip or stiff edge of the mask so it takes the shape of your nose bridge. Once the mask is soiled, remove it by holding the ear loops. Dispose soiled mask into the bins. Wash your hands thoroughly with soap and water after disposing the mask. How do masks prevent the spread of flu? 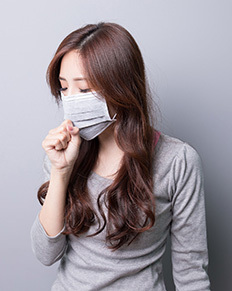 Masks contain filters that block out germs and pollutants. 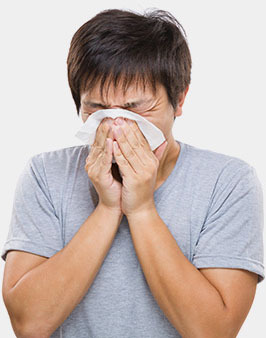 If you’re sick, wear a mask to cover your nose and mouth to prevent germs from spreading when you sneeze or cough. How effective are masks in stopping virus transmission? Researchers have found that by wearing masks, persons with the flu had a 25-fold decrease in the amount of large virus particles they exhaled compared with those not wearing a mask. Influenza is commonly known as "flu". It is highly contagious and can affect anyone, including healthy people. It could lead to severe complications like pneumonia, bronchitis, sinusitis, ear infection, meningitis (inflammation of the lining that covers the brain) or even death. Both conditions may start off with a stuffy nose, sneezing, sore throat and cough, but flu comes with more severe symptoms such as high fever (>38°C), headaches and fatigue. Flu can spread directly from person to person. When someone infected coughs, sneezes or speaks, the virus can be transmitted into the air via droplets. You may then breathe in the virus, which attacks your respiratory system and cause your mucous membrane to be inflamed. Flu can also spread indirectly by touching a surface with flu viruses on it, and then by touching your own nose or mouth. You may also catch the disease by sharing food with an infected person. STOP THE SPREAD OF INFLUENZA WITH F.i.g.h.t. PROTECT AGAINST INFLUENZA WITH F.I.G.H.T. Influenza viruses evolve constantly and quickly. The most effective way to protect yourself is to immunise yourself once every year. It takes about 2 weeks for a vaccine to take effect, so get the vaccination before peak flu season starts. In Singapore, the season is generally from November to January, and April to July. Vaccinations are offered at hospitals, polyclinics and GP clinics, costing between $35-$50. You can use your Medisave account (up to $400 per year per account) for flu vaccinations on persons with higher risk of developing influenza-related complications such as very young children, the elderly and people with chronic diseases such as diabetes. Prevention via flu vaccination is the best route to take. While not a substitute for this, antiviral medications may help reduce the severity of symptoms and help you recover faster. If you have flu-like symptoms, see your doctor immediately. Do not engage in any strenuous physical activities until you are completely well again. What is HAND, FOOT & MOUTH DISEASE ? Hand, Foot & Mouth Disease (HFMD) is a highly contagious viral infection caused by a group of enteroviruses, most commonly the Coxsackie virus. It has become a prevalent disease that primarily affects children below five years old. HFMD is present in Singapore all year round, and the seasonal outbreaks occurring in childcare centres, kindergartens, and schools are generally mild. However, a certain type of the virus, EV71, can give rise to serious complications that usually involves the heart and nervous system (e.g. encephalitis), and may cause fatality. HFMD spreads from person to person by direct contact with the nasal discharge, saliva, faeces or fluid from the rash of an infected person. Young children, in particular those below the age of five. STOP THE SPREAD OF HFMD WITH F.i.g.h.t. Keep your child at home, away from his/her school, kindergarten or childcare centre, all public places including restaurants, playgrounds and shopping malls. Keep your child at home until all the blisters have dried up and he/she has fully recovered, after the expiry of the medical certificate (MC) given by the family doctor. Look out for signs and symptoms in other family members, both children and adults. If any family member starts to feel unwell, see a doctor immediately. Keep your child’s toys, books, eating utensils, towels and clothes separate from others. Inform your child’s school, kindergarten, childcare centre or enrichment classes as soon as possible so that precautions to minimise the spread of HFMD can be taken. Please note: If your child is diagnosed with HFMD, please keep him/her at home. Your child should only return after the expiry of the medical certificate (MC), or when he/she has fully recovered. 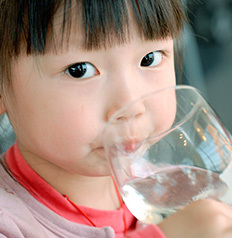 PROTECT AGAINST HFMD WITH F.I.G.H.T. Rash with vesicles (small blisters 3–7 mm) on hands, feet and diaper area. The vesicles are typically on the palm side of the hands and the sole side of the feet. The rash may also be present on the buttocks, arms and legs. Symptoms may vary between individuals, and at different stages of the disease e.g. some may only have a rash or some individuals may show no symptoms at all. How can I treat HFMD? There is no specific treatment for the infection other than symptomatic relief. If you suspect your child has HFMD, please take him/her to your family doctor. Tuberculosis (TB) is an infectious disease caused by a germ known as Mycobacterium Tuberculosis. 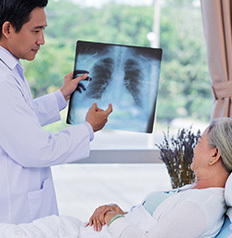 TB can occur in any part of the body, but most commonly affects the lungs (pulmonary TB). Tuberculosis is spread by breathing in droplets containing the TB germs. 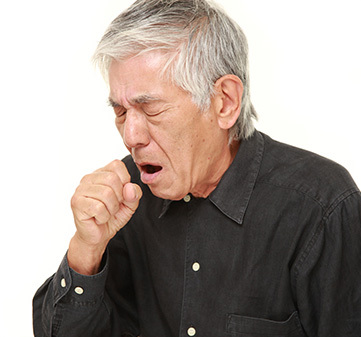 When someone infected coughs or sneezes, TB germs are released into the air. Other people get infected when they inhale these TB germs. Not everybody who gets infected with the germ develops the disease. The body’s immune system 'walls off' the TB germ, which can lie dormant in the body for years. TB disease develops in about 10% of those infected. 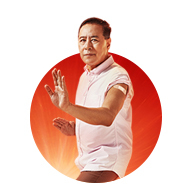 If your immune system is weakened e.g. by HIV infection or drugs, the chance of getting TB will be higher. STOP THE SPREAD OF tUBERCULOSIS WITH F.i.g.h.t. PROTECT AGAINST TUBERCULOSIS WITH F.I.G.H.T. Immunisation is the best way to protect young children against tuberculosis. One dose of the BCG vaccine is given to babies at birth in the hospitals. Skin testing is advised annually for those people whose immune system is weakened due to HIV infection or for those who have a substantially increased risk of exposure to the disease such as healthcare workers. HOW CAN I TREAT TUBERCULOSIS? If you have a cough that persists longer than 3 weeks or any of the other symptoms, see your doctor immediately. If you know of someone who has the same symptoms, encourage the person to see one as well. Your doctor will ask you to go for a chest X-ray. In the event of a more serious case, you may be referred to a specialist for further investigation. Most people with active TB disease do not need to be hospitalised, but they will need to go for Directly Observed Treatment (DOT) under the national TB programme. 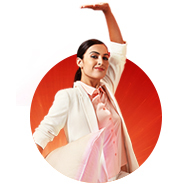 The DOT programme requires them to take TB medication under the direct observation of a nurse at the polyclinics. It is important that persons with active TB disease adhere to and complete their treatment regimen even if they start to feel better after the initial period of treatment. Treatment typically lasts 6 - 9 months. Stopping treatment or skipping doses can make TB resistant to medicines, leading to the development of drug resistant TB. In such situations, a different set of stronger drugs with more side effects must be taken for 18 - 24 months. The chance to cure is also lower. WHAT IS Pneumococcal Disease ? Pneumococcal Disease (PD) is the leading vaccine-preventable cause of death in children and adults worldwide. This bacterial infection causes pneumonia, meningitis, bacteraemia and other life-threatening ailments, but it can be prevented by vaccination. Pneumococcal disease is caused by a bacterium called Streptococcus pneumoniae, which is also known as pneumococcus. There are more than 90 serotypes of this bacterium. Not everyone exposed to the bacteria develops the disease. Some people become carriers while others progress to develop the infection. 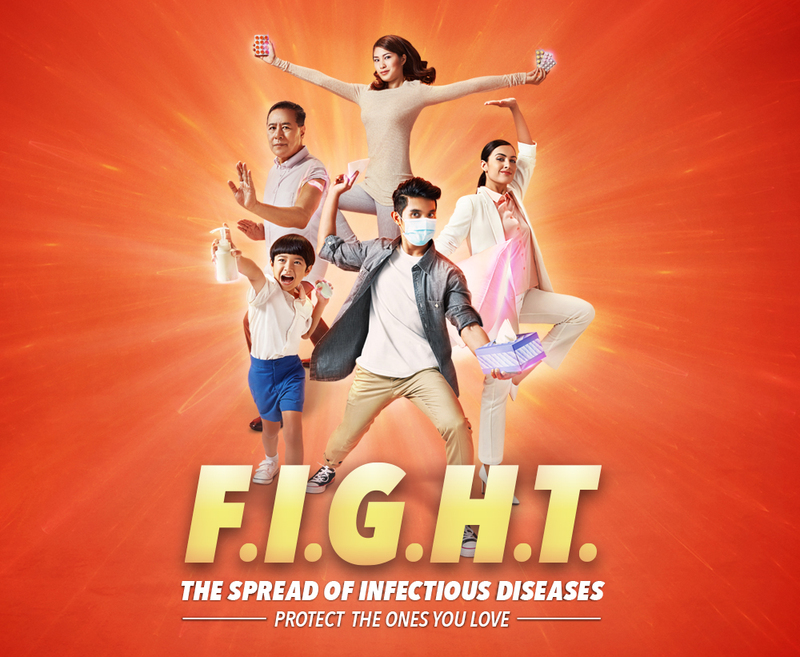 STOP THE SPREAD OF PNEUMOCOCCAL DISEASE WITH F.i.g.h.t. PROTECT AGAINST PNEUMOCOCCAL DISEASE WITH F.I.G.H.T. 1) A pneumococcal polysaccharide vaccine (PPSV23) for those who are at an increased risk of developing severe PD. PPSV23 protects against 23 pneumococcal serotypes. Persons aged 65 years and above who previously received PPSV23 before age 65 are recommended to receive another dose of the vaccine if at least 5 years have passed since their previous dose. 2) A pneumococcal conjugate vaccine (PCV) for infants, children under 2 years, and young children. The number of doses and the intervals between doses depend on the child's age. Refer to the National Childhood Immunisation Schedule or ask your child's doctor for more details. The vaccine may cause mild fever and some soreness around the site of the injection, which usually lasts only for a short time. 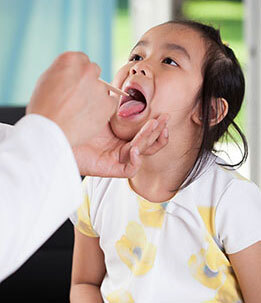 If your child has severe cough or if he/she has high fever, stiff neck, difficult or fast breathing, take your child to a qualified health professional for assessment immediately. Early treatment of pneumonia can prevent serious complications and death. You can use your Medisave account (up to $400 per year per account) for your child's pneumococcal disease vaccinations. Medisave can also be used to pay for pneumococcal disease vaccination with PPSV23 for persons in high risk groups as indicated above. PD is most common in children under the age of 2 years and in adults aged 65 years or older. Within 1 – 3 days of infection, signs and symptoms may appear, and vary based on the systems affected. How can I treat PNEUMOCOCCAL DISEASE? Prompt treatment with antibiotics, such as penicillin, is usually effective. However, in recent years, treatment has become more challenging with emerging antibiotics-resistant strains, particularly to penicillin. In this case, a longer hospital stay along with expensive alternative therapy may be needed.